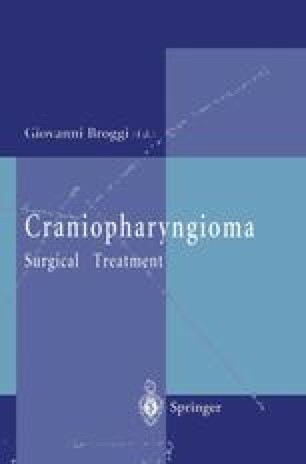 Although Northfield’s opinion of 1957 that: “the treatment of these (craniopharyngioma) patients is fraught with difficulty and disappointment to a degree probably not offered by any other intracranial tumor with exception of glioblastoma” nowadays sounds unacceptably pessimistic, craniopharyngioma surgery is still a major challenge, even for experienced neurosurgeons, and many consider it one of the most delicate intracranial procedures (Baskin and Wilson 1986; Cushing 1932; Hoffman et al. 1992; Katz 1975; Manaka et al. 1985).